I've attempted to make a Wild Rice and Onion loaf recipe from here. There isn't anything wrong about the recipe, but the environment is all wrong here at Casa de Batata. We have an old house here in South Minneapolis and it is a bit, um, drafty, to say the least. Since the place is insulated with newspapers from when the house was constructed, it does leave a bit to be desired in the protection-from-the-winter department. Raising a dough in cool conditions isn't a problem here in November, but the second fermentation requires more time (which I didn't have) or a higher temperature (which I didn't think of). Having a cold house is part of the cheap way we live but why I didn't have time is part of the reason we live extravagantly. We are rarely home, so keeping a warm house makes little sense. The animals have fur and live quite well without temps in the 60's. The humans are rarely home and the need for warmer temperatures are seldom so we don't need the thermostat set high. And, referencing back to the inadequate insulation, it doesn't make sense either. Regardless, this is a long way around to the point that we have a cold house and with a bit of thought I figured that my rolls and my loaf didn't rise because of the temperature of the kitchen. Of course, there is no way to fix the recipe or the loaves, but I do see a future where their participation for my Thanksgiving meal has been, uh, cemented, as perhaps as the ingredients of the dressing for the turkey. I just need to let it go stale. Lesson learned; make sure that you have the oven ready and that the kitchen is in DefCon1 when the time to proof stuff is ready. Luckily, at Thanksgiving this is difficult. By the bye, should any of you find yourself without a place to be, or a place where you wish not to be, let us know as our Orphan Thanksgiving always has a seat for you, just let us know and we'll make a place for you. I promise to raise the buns correctly this time. Yup, you heard me right, I'm baking. I feel as if I'd just taken off the training wheels, or, better yet, found myself wobbling upright on my own two legs. I wish I could explain the feeling of accomplishment I feel right now. 30+ years of "there's no way I can learn to do this" is washed away in one weekend of "shut up and try." I stumbled across a web site called The Fresh Loaf and followed the first lesson. I don't know why this was such a challenge for me, but I decided to make a loaf of bread. Perhaps the simplicity of the instructions, the fact that I wanted more than anything to bake, the fact that I needed to feel a victory, I can't say, but I mixed flour, salt, and yeast with water, and worked the dough by hand. Confession time: I hate the feeling of dough clinging to my hands, clumps between my fingers, that sensation of stickiness drives me nuts. This may have something to do with my fear of baking. I managed to get past the feeling of the wet dough (with the help of lots of flour) and created a smooth, satiny final product -- that didn't stick to my hands, much to my relief. It raised, I punched it down and shaped it, it raised again and I put it in an oven. It baked and I had bread. That's it. "Golly, that's all there is to this?" I felt sort of stupid. Huh, that wasn't hard at all. So, I pulled out my bread baking books (I have a couple) and took a look at the first recipes. 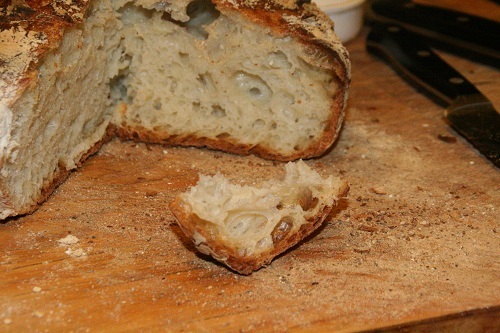 I made the first recipe from Jim Lahey's My Bread, an artisan loaf that is simply made by mixing flour, yeast, salt, and water and letting it set for 18 hours. 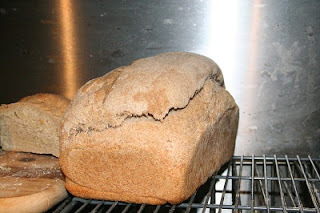 You then roughly shape the loaf and let it ferment a second time and drop it in a hot Dutch Oven or casserole dish and cook it at high heat for 30 minutes and then with the lid off until the loaf browns. This loaf is amazing. The smell, the crumb, the taste, the texture and the crust are just something to behold. I was convinced to purchase this cookbook by a focaccia recipe in the local paper. I managed to make one (actually two; with first, the non-stick pan's "non-stick" coating flaked into the bread, ruining it) and I was impressed with the ease of it. 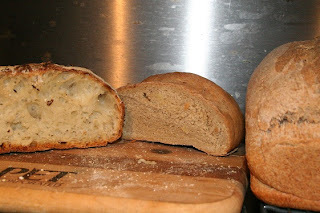 He gave me the confidence to try a "real" bread and you can see the result. I then followed the basic recipe from Ed Brown's The Tassajara Bread Book and this is the opposite of the "fire and forget" Jim Lahey recipe. You make a wet "sponge," let it sit, and then add oil, salt and more flour and then knead the dough, let it rise, then punch it down and let it rise again. You then split the dough into loaves, shape them and then let them rise once again in the bread pans. You finally bake it. This is the labor-intensive loaf that most people (especially me) fear. The true amount of time needed is considerably less than you would think, so the work is worth it and kneading the dough is fun.